You may have thought The Killers and The Cure were headlining this year's Glastonbury Festival. It was, after all, officially confirmed by organisers earlier this month that they would top the bill at Worthy Farm come June. But Janet Jackson's Twitter feed tells a slightly different story. 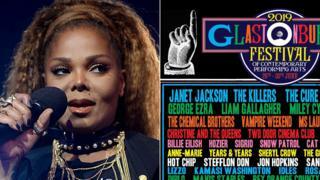 The R&B star was added to the Glasto line-up on Friday - a bill which also features the likes of Stormzy and Kylie Minogue. The version of the Glastonbury poster Jackson has tweeted, however, has seen her bumped up to the top slot. It's unclear whether the singer's team asked for this version of the poster to be made or whether Glastonbury offered it (we've asked them both). But we think it's unlikely Janet was up late one night on Photoshop doing it herself. Jackson is making her Glastonbury debut this year, with her first UK date in eight years. More than 60 acts are on the line-up so far, including George Ezra, Miley Cyrus, Anne-Marie and Liam Gallagher. Glastonbury is expected to announce the rest of the bill closer to the festival itself. The event sold out in just half an hour last October, but cancelled tickets will be put back on sale on Sunday, 28 April. Organisers recently confirmed that The Prodigy had been booked to play prior to frontman Keith Flint's death earlier this month. It's not the first time a line-up has been altered to bump an artist up the pecking order. Last month, The Sherlocks admitted photoshopping the Y Not line-up poster so they appeared higher than The Amazons. In the original, released by Y Not Festival, The Sherlocks featured on the fourth tier of acts. But in the one they shared they were in the third tier. "We just thought we'd do it for a bit of a laugh. Now everyone's talking about it," the band's drummer Brandon told Newsbeat. A spokesperson for Y Not said there was only one official poster.